The Nintendo DS was launched under the promise that it allowed for new ways to play games. Over its lifetime, system updates and accessories have continued to push the system in terms of new types of gameplay. Nintendo DS hardware uses the serial code NTR (Nitro). Nintendo DS Lite hardware uses serial code USG. The Nintendo DSi hardware uses serial code TWL and WAP. The Nintendo DSi XL uses serial code UTL. The meaning of USG, TWL, WAP and UTL are not currently known. The original model Nintendo DS features a metallic grey casing in a clamshell design. Each half has a screen, with the lower screen featuring touch sensitivity. A stylus can be stored inside the system, and a thumb strap can be attached to a hook. The system accepts Game Boy Advance and Nintendo DS games in either of its cartridge ports. The Nintendo DS also comes with built-in PictoChat software for local wireless chat. Following negative press surrounding the appearance of the original DS, the Nintendo DS Lite was released in March 2006. It was smaller and more streamlined than the first model, and featured brighter screens. The third model of Nintendo DS, the DSi, was launched in 2008. 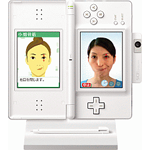 Similar to the Lite in appearance, the DSi added some new features, including two cameras - one pointing towards the player and one pointing away from the player. The DSi removed the ability to play Game Boy Advance games in favour of improved online capabilities and an online DSi Shop. From here, DSiWare games could be downloaded to the system, making use of its unique features. The fourth model of Nintendo DS, the DSi XL, was released in 2009. It retained all of the functionality of the Nintendo DSi, but featured larger screens, a larger stylus, and so the system itself was larger. The system was initially designed for older players, but it proved a popular model for all ages. A cartridge that fits into the Game Boy Advance slot of the Nintendo DS and DS Lite models, adding force feedback functionality to compatible games. The Rumble Pak is not compatible with the DSi or DSi XL models. The memory expansion pak fits into the Game Boy Advance slot of the Nintendo DS and DS Lite models, improving the memory capability of the systems so they could be used for internet browsing using the Nintendo DS Browser. The Memory Expansion Pak is not compatible with the DSi or DSi XL models, but these systems already have the ability to browser the internet using the dedicated browser downloaded from the DSi Shop or built into the system. The Slide Controller is an attachment for the Nintendo DS and DS Lite that connects through the Game Boy Advance slot. Once attached, the system should be set on a table, and compatible games can be played by sliding the DS around on the surface. The Slide Controller is not compatible with the Nintendo DSi or DSi XL models. The Magnet Stand and Facening Scan accessories came packaged with DS Face Training. You can attach the Nintendo DS to the stand, and attach the Facening Scan cart through the Game Boy Advance port. This allowed for your face to be displayed on the screen as you train your face muscles. 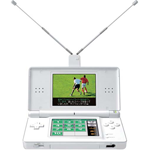 The DS TV is a TV signal receiver system that uses the 1seg service to transform the Nintendo DS into a television. The bottom screen displays controls while the top screen displays the TV programme. The DS TV connects through the Nintendo DS cartridge port, and so is compatible with all models of Nintendo DS. 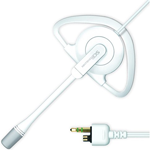 A headset that connects to the Nintendo DS headset port, allowing for voice chat when playing compatible games online. The headset can also be used in place of the microphone built into the Nintendo DS. A pedometer with an infra-red communicator for sending data to compatible games. The Activity Meter has a clip to attach to clothing in order to count your steps, and it can store up to 7 days worth of walking data before it needs to be connected to a compatible game. 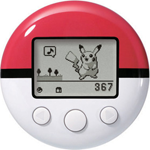 A pedometer which doubles as a training device for Pokémon: HeartGold & SoulSilver. You can send a Pokémon to the Pokéwalker and carry it around attached to your clothing, earning experience and items that can be transferred back to the game. A wireless bluetooth keyboard for the Nintendo DS, released in 2011 alongside Battle & Get! Pokémon Typing DS. They keyboard is used primarily for typing training. A USB wi-fi connector that can be attached to an internet-enabled home computer in order to create a wireless hotspot so the Nintendo DS can connect to the internet. 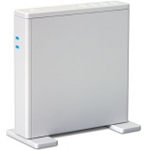 A network adapter that connects directly to a home internet connection to create a wireless hotspot that can be used by the Nintendo DS and the Wii to access the internet.